Chris Knox was born in Invercargill in 1952. He is described on his website as being a “musician, artist, father, writer, film critic & jandal wearer.” Though primarily known as a musician, Knox has also been spent time as a music producer, video maker and cartoonist. Since the late 1970s he has been an important and influential figure in the New Zealand music scene, and has so far released 46 titles under 7 different artist names. 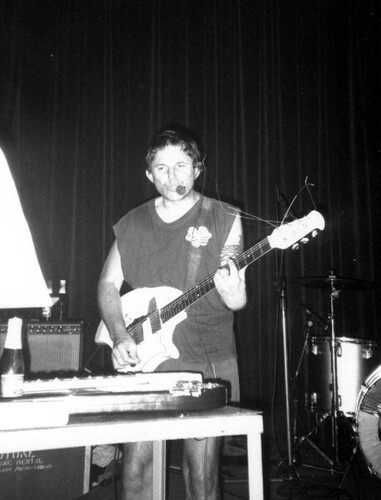 He formed one of this country’s first punk bands, The Enemy (1977–78), which grew into Toy Love (1978–80) after a move to Auckland and the addition of band members. They signed to WEA, but following some time performing and recording in Australia they disbanded. Their singles and album were repackaged and re-released in 2005. With ex-Toy Love/The Enemy guitarist Alec Bathgate, Knox formed Tall Dwarfs in 1981. Knox purchased a TEAC four track and through their do-it-yourself ethic helped pioneer lo-fi indie rock, influencing bands such as Pavement, Yo La Tengo, and Neutral Milk Hotel. The TEAC was used to record many of the early releases on Flying Nun including The Clean’s ‘Tally Ho’ and ‘Getting Older’ singles, and the ‘Dunedin Double’ EP. Due to his heavy involvement in the development of the label, Knox has been called the ‘spiritual godfather’ of Flying Nun. 1981 also saw the release of Knox’s first solo record, the ramshackle ‘Songs For Cleaning Guppies-C.Knox Ego Gradification Album’. Knox’s best known song ‘Not Given Lightly’, a love song written for his partner, was first released in 1988, and while not a commercial success has gained iconic status being named #13 in APRA’s 2001 list of the all-time top 30 New Zealand songs. In the mid-2000s, Knox reconvened the band concept under the name The Nothing, releasing two albums. Alongside his various musical activities, including numerous overseas tours solo or with Tall Dwarfs, Knox has also been involved in film reviewing for various publications and TV shows, as well as hosting a show screening classic movies, called ‘The Vault’, and fronted the arts programme ‘The New Artland’. He has written a cartoon strip under the name Max Media for the New Zealand Herald since 1987. On June 11 2009 Knox suffered a life-altering stroke at his home in Grey Lynn. There was an immense public outpouring of support for Chris and his family following the announcement of his illness. His international reputation an influential musician resulted in the release of ‘STROKE – Songs For Chris Knox’, a tribute album with Knox’s songs performed by local and international musicians. Knox was selected as an Arts Foundation of New Zealand Laureate in March 2009. Despite his stroke, he continues painting and drawing, and has also performed on a number of occasions with The Nothing, and has been recording new material with Alec Bathgate. Knox lives in Auckland with his partner, the sculptor, Barbara Ward.